ASCO, Chicago, IL · 2018, Chajon E. et al. Hepatocellular carcinoma (HCC) is the most widespread primary liver cancer. Liver metastasis (mets) are even more common with a wide range of malignancies. Management of both liver affections is a challenging task regarding toxicity toward liver functions. In response, NBTXR3, innovative injectable hafnium oxide nanoparticles activated by radiotherapy, was developed to increase the local deposit of energy within the tumor cells without negatively affecting the liver. 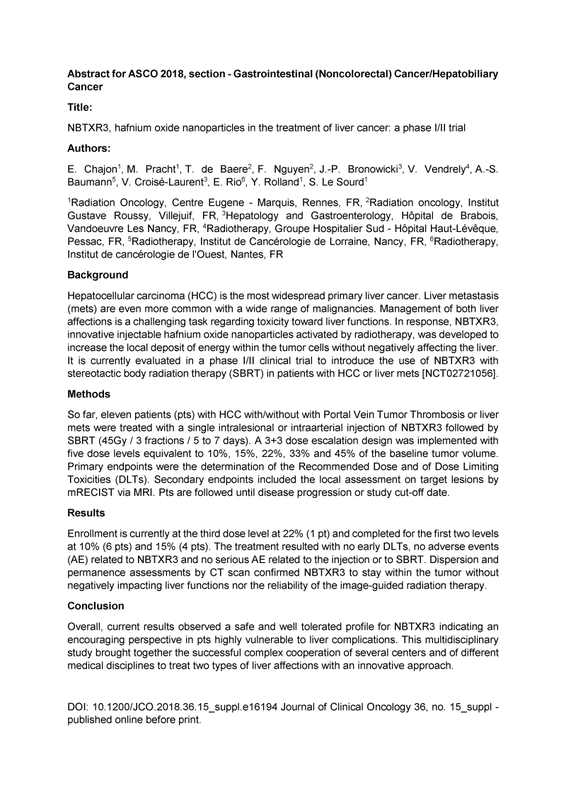 It is currently evaluated in a phase I/II clinical trial to introduce the use of NBTXR3 with stereotactic body radiation therapy (SBRT) in patients with HCC or liver mets [NCT02721056]. Overall, current results observed a safe and well tolerated profile for NBTXR3 indicating an encouraging perspective in patients highly vulnerable to liver complications. This multidisciplinary study brought together the successful complex cooperation of several centers and of different medical disciplines to treat two types of liver affections with an innovative approach.